The gentleman who rescued me at the airport the last time I visited (see Born in Texas, Complete in Mexico) is the one who I went with today. I got called up to speak and be introduced to the people and I told how Flaca has given me my greatest blessing of all – Family. Words can’t express what it feels like to be here in Mexico with my fiance and our expectant son Leo and to give thanks on the altar to Flaca for this! Two reporters approached me afterwards for questions regarding the faith. When asked what I pray for I honestly answered – Humility, food, shelter, family. I told them my story of coming back from Juarez just a few years ago, stopping east of El Paso to piss and realizing I was by a shrine – laughing I said: Ok skeleton lady, if you are legit, prove it, humble me, break me! A few months later I was jobless and homeless. When I finally managed to get things moving forward again, I was hit with a blown back that put me out of work. My desperate prayer for help was followed by a miraculous return to my career in geo-sesmic surveying and a degree of healing in my back! There is so much more to Santa Muerte than what is seen publicly. In the states it seems, from my personal interactions with folks, her power is measured by hexes, spells, and her effectiveness in occult work. I have great faith, however, in what Arley Vazquez is doing in Queens. She has brought this sense of a vital community of faith to the United States in a very powerful way. In Mexico Santa Muerte is seen differently, as I’ve learned living in Ecatepec. Her power is measured by the fact my fiance safely arrives at work every day in a city that is notorious for femicide. Here her power is measured by her capacity to keep her devotees from being robbed raped and killed walking to the store. The canal less than a mile from home here was dredged last year and the remains of 23 women were found. Even those familiar with the rougher areas of Mexico D.F. do not like coming to Ecatapec after dark. Moral of the story, I asked flaca to take me to the humble and poor heart of Mexico and this is the ghetto of CDMX without a doubt. As I said at the Temple, Santa Muerte has literally altered the course of my life. In my opinion for the better. I am where I should be – with family. The bond between my fiance’s son and I has grown very strong. As much as I needed family and children, he needed a father. Attendance at the Temple is very much a family and community oriented experience. An experience that is lost in description, it must be seen first hand. As we all know, the media has no interest in promoting a family and community oriented faith, a Narco saint, blood baptism and human sacrifice is much more titillating. On the left is a picture of my first personal altar erected in Mexico. You may notice that something is missing on the statues – her scythe. At some point someone thought it was appropriate to replace her scythe with an AK-47 ( Cuerno del Chivo ) . It seems a safe assumption that the depictions of SM holding an AK are rooted in the Narco branch of our family tree. I think the “family tree” is the best term for the cult given the some of the far flung variants in her iconography. And that blood soaked branch unfortunately garners the most attention. Using terms and iconography here, I see our branches beginning to shade out the lower branches of our family tree. The success of Santa Muerte International is a testament to that fact. There is a “power” that radiates from Enriqueta Vargas, a flame in her eyes that supersedes any of the pomp and bluster of other “leaders/teachers” I have met, albeit at times rather unsettling to be in her presence, it is not fear, but awe. She truly does “channel” the overarching love and protection we experience in devotions to Flaca. In no way does one feel that they are in the presence of a dangerous bruja, on the contrary, I personally see a powerful Healer and Protectress, her smile and power in her hand shake can alter the trajectory of a persons life. I feel that the sense of “awe” that I experience is also attributable to Commandant Pantera, but his spirit is more difficult to articulate, and a subject best left alone for now, aside from saying that I have found him to be efficacious. As with the shading of our bloodied branches, I believe in time we will see the psychology of the scythe as a negative replaced by family and community oriented faith with the scythe representating the bounty of the harvest, as it already does for many of us. But an equal number see the scythe only as blood stained. We can never divorce ourselves from the Narco branch of our family tree, but as Santa Muerte’s presence in our world and Santa Muerte Internacional itself grows I hope we continue to shade out the narco-branches and what rotten fruit they bear will wither and fall away. In 2027, after another decade of development, I think we are going to look back and be amazed at the progress as an organization we have made, and the overall changes in the faith as a whole. That’s a very inspirational story, David. I am becoming more and more intrigued by the worship of Santa Muerte every day. It’s easy for people to dismiss the worship of the skeleton saint as one that is primarily practiced by cartel members and criminals, but it is much more than that. Santa Muerte is the fastest growing religion in the Americas and people from all walks of life flock to her in search of comfort, love, abundance, prosperity and healing. 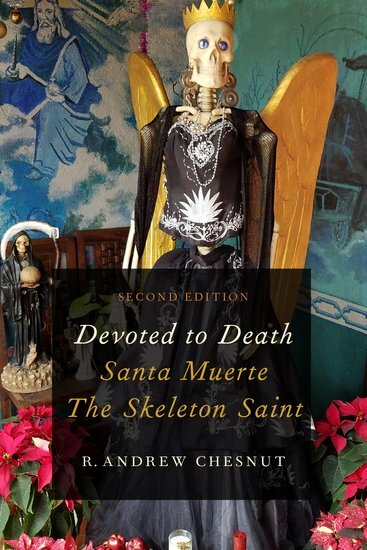 I’m glad to hear Santa Muerte has had such a profoundly positive effect on your life.